Explanation: What does it look like to approach a comet? Early this month humanity received a new rendition as the robotic Rosetta spacecraft went right up to -- and began orbiting -- the nucleus of Comet 67P/Churyumov-Gerasimenko. This approach turned out to be particularly fascinating because the comet nucleus first revealed itself to have an unexpected double structure, and later showed off an unusual and craggily surface. The above 101-frame time-lapse video details the approach of the spacecraft from August 1 through August 6. 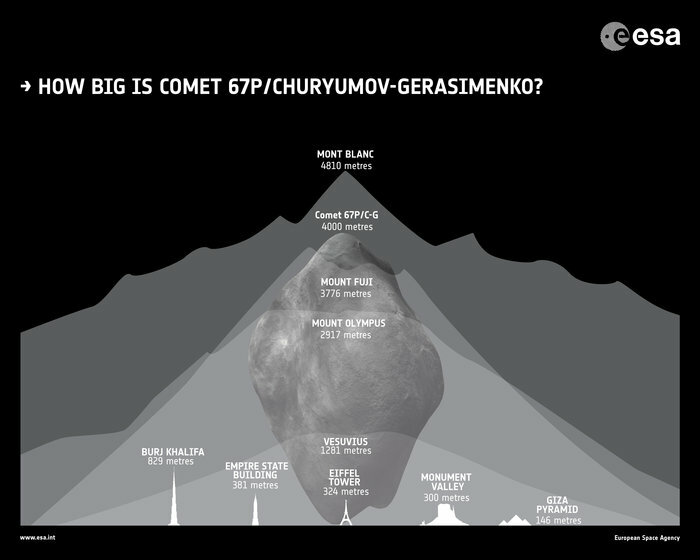 The icy comet's core is the size of a mountain and rotates every 12.7 hours. Rosetta's images and data may shed light on the origin of comets and the early history of our Solar System. Later this year, Rosetta is scheduled to release the Philae lander, which will attempt to land on Comet Churyumov–Gerasimenko's periphery and harpoon itself to the surface.